"The Holy Antonius' Last and Greatest Temptation". 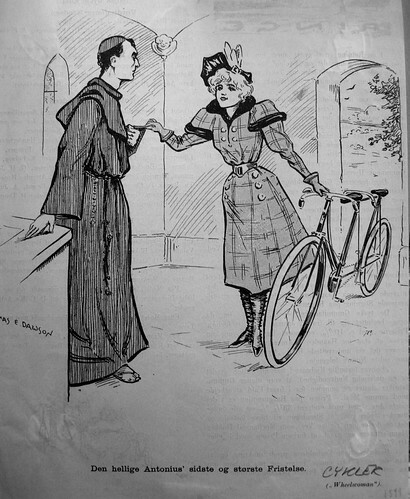 A cycling girl offering him a ride on a new-fangled tandem bicycle. The man was sold. Vintage Danish Tuborg beer advert featuring, yet again, the iconic cycling girl. 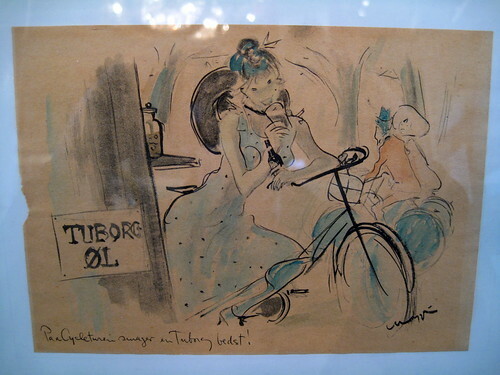 "A Tuborg tastes lovely on a bicycle ride!" This latter advert features in a new exhibition at the Copenhagen City Museum called Copenhagen by Bike. All about the history of the bicycle in Copenhagen. I was involved in the exhibition and have a number of photos in it. You can read more about it here on Copenhagenize.com, including how to get there if you're in Copenhagen. It runs until June 2010. The first one reminds me of a classic cycling poster with a cycling maiden in the woods sorely tempting a holy ascetic to leave his vocation. I wish I could find it again!